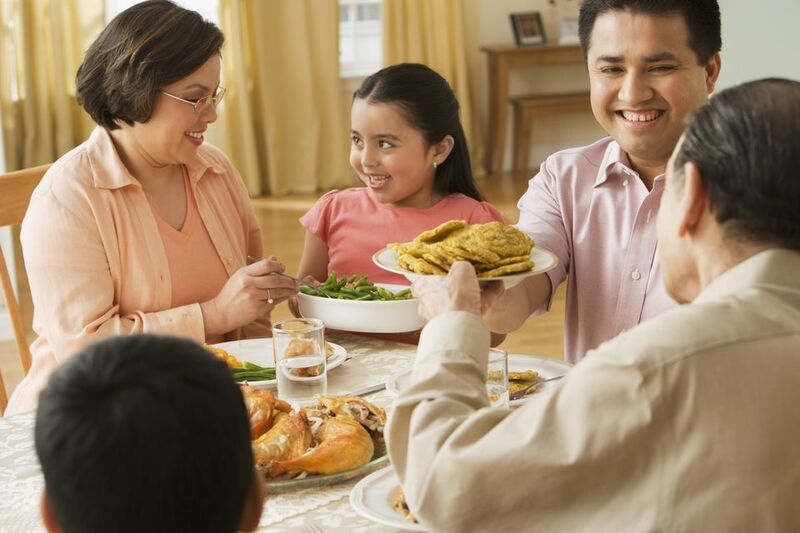 Thanksgiving is one of the most American of holidays, and as American citizens, Puerto Ricans have adopted some of the customs and traditions of this annual celebration. Much of the Thanksgiving holiday is celebrated in Puerto Rico in the same way as it is in the States: Most businesses are closed, family members get together, there is a ridiculous amount of food, and people go shopping on "Black Friday" the day after. However, the biggest difference in traditional American Thanksgiving and the kind you'll find celebrated on the island is the food. Combining classic American Thanksgiving traditions with flavors from Puerto Rico's Latin American heritage, you can expect spice-enhanced favorites like turkey, ham, and even dressing at a Puerto Rican Thanksgiving meal. Unlike in most of the continental United States, Puerto Rican Thanksgiving starts with serving a unique island appetizer: traditional Latin plantains, a type of large banana. Most Puerto Rican meals start with some sort of plantain dish, but for special occasions, some Puerto Rican families will make something called guineos en escabeche, or pickled bananas. Featuring green bananas tossed with sauteed onions, green olives, olive oil, and vinegar combined with savory herbs like oregano and bay leaves, this dish is also commonly served on birthdays. No Puerto Rican celebration is complete without tostones, another plantain-based starter common to Central America and the Caribbean that tastes completely different from guineos en escabeche. For tostones, the plantains are sliced then deep fried until crispy and golden. For extra taste, they can first be dipped in garlic water or served with a garlic dipping sauce. Thanksgiving is all about the turkey, even in Puerto Rico, but the turkey is cooked a bit differently on the island. One method is known as pavochón, which involves roasting a turkey or large chicken that's been seasoned with garlic, oregano, and adobo (a Spanish paprika blend). Other times, the turkey is stuffed with mofongo, a plantain dish often considered the most popular on the island. Mofongo is made with fried and mashed green plantains, mashed garlic, and crunchy pieces of fried pork rinds called chicharrón. As with American Thanksgiving, the Puerto Rican meal is complete with a variety of special sides, including mofongo turkey stuffing, morcilla (blood sausage), and arroz con andules (rice with pigeon peas), the Puerto Rican version of rice and beans. Other side dishes include alcapurrias (fritters), coquito, and Puerto Rican style potato salad. Instead of the traditional American pumpkin pie, Puerto Ricans typically finish off their Thanksgiving meal with tembleque, a cinnamon-coated coconut custard. Another favorite is the custard-like dulce de leche made from caramelized milk, which is sometimes seasoned with pumpkin spices to add a traditional American touch to the dish. Puerto Ricans like to relax after a heavy feast, and you'll find many residents of the island at the beach in the early afternoon soaking up the sun. Families typically stay together throughout much of the evening, often going to Black Friday sales together the following morning. Many families also take the opportunity to start decorating for Christmas by putting up and lighting their trees while everyone's gathered around for the holiday. That's because Thanksgiving officially kicks off the Christmas season in Puerto Rico, a wonderful time of the year on the island. If you're visiting Puerto Rico in late November and early December, you can expect to see lights popping up in shops and homes as well as a variety of special holiday events happening throughout the month.